You'll feel all gooey inside. 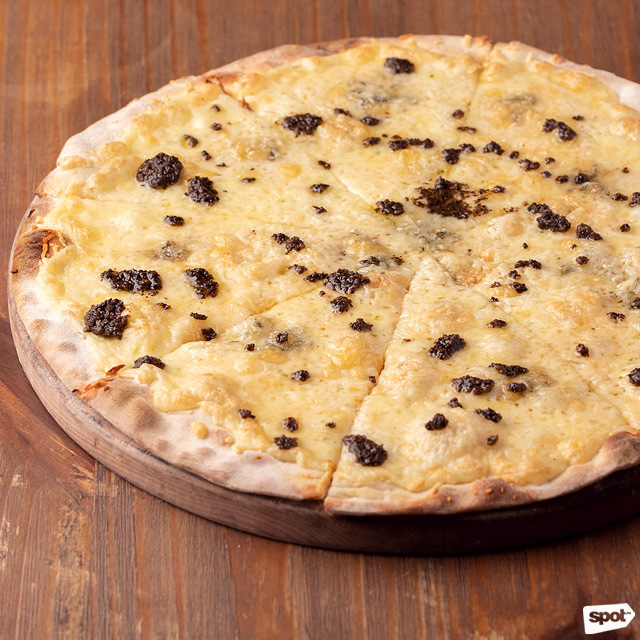 (SPOT.ph) Provolone, cheddar, mozzarella—for cheese lovers, these words probably sound like music to your ears. Lucky for you, the Metro’s restaurants are never lacking in ultra-gooey, cheesy dishes to satisfy these cravings, and they come in all shapes and sizes, too. 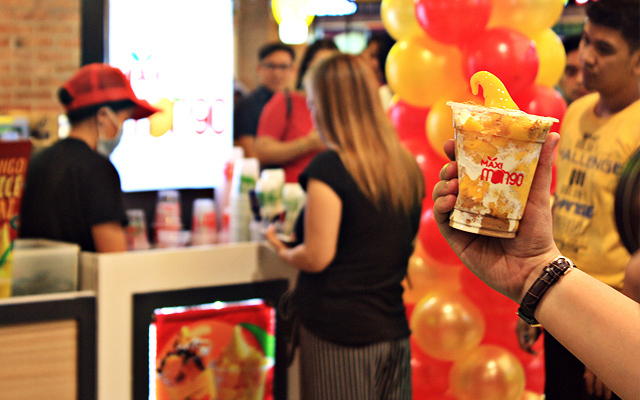 We list some of the newer ones in Manila that are worth checking out. Because Da Gianni is an Italian restaurant, you can expect lots of cheese on the menu, but the Quattro Formaggi (P520) steals the show. For one, this pizza has four different kinds of cheeses—Gorgonzola, pecorino, mozzarella, and provolone—in glorious gooey harmony. 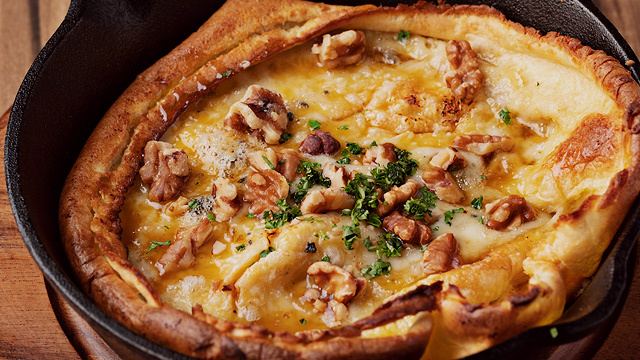 They don’t skimp on this cheese blend either, and it says a lot about their perfectly crisp-yet-chewy crust that it doesn’t crack under all that weight. But, what really sets this cheese pizza apart from the rest is the generous heaps of truffle paste on each slice, for a strong blast of that distinct earthy flavor that makes this Quattro Formaggi extra indulgent. This new Kapitolyo café specializes in pretty eccentric coffee creations (the Espresso Pop with coffee and rootbeer is a must-try!) so pairing it with a familiar, comforting snack makes perfect sense. 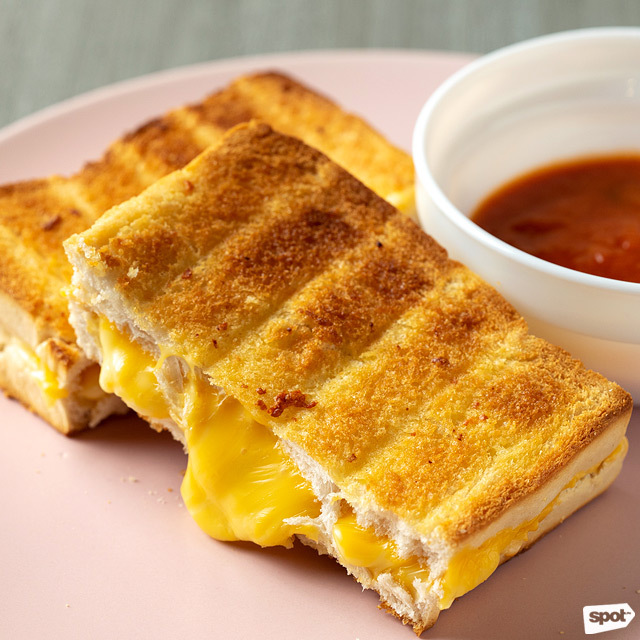 Nicto’s doesn’t stray far from the traditional with their Grilled Cheese Sandwich with Tomato Soup (P245), but that’s more than enough, especially when they execute it so well. With a sandwich oozing with sharp, melted cheese and paired with a bowl of thick and hearty tomato soup for you to dunk it into, this meal is filling and tasty any time of the day, and with any of their coffee options. Nicto’s Coffee Shop is at 58 East Capitol Drive, Kapitolyo, Pasig City. You may not be able to go on that Europe tour yet, but you can take a culinary one at Vanderlust. 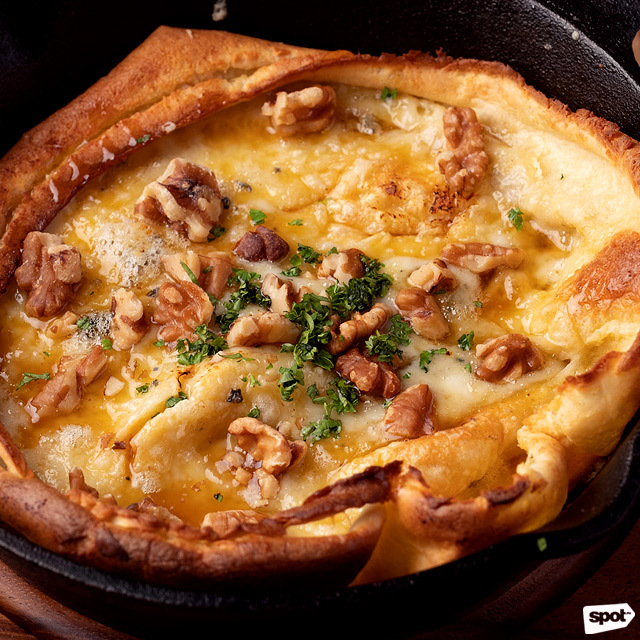 And they don’t just focus on your usual Italian or French either: Take the Dutch dish, Cheese With Cake (P298), which is a must-order if you can’t get enough of cheese and fluffy crepe. There’s lots of gooey cheesiness to go around, especially with a blend of four cheeses, but you also get complementing sweetness from truffle honey and crunch from walnuts. A winning dish all around, if you ask us. Vanderlust is at 5/F The Podium, ADB Avenue, Ortigas, Mandaluyong City. Here’s something you should know about Half Saints: When you see chicharrón on their menu, don’t expect your usual pork-crackling snack. 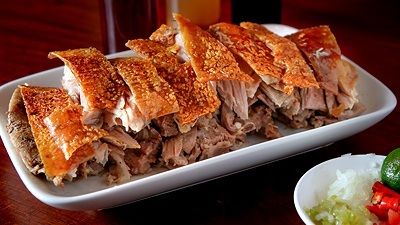 What they serve here is Tarlac-style chicharrón, which is crispy, golden-brown, deep-fried pork belly that resembles bagnet—and they don’t serve it as is, either. Take the Chicharon Teriyaki (P295), which owner Christine Roque describes as a “Tokyo meets Tarlac dish.” The beautifully-plated dish comes with nori strips carefully fanned out, golden slices of chicharrón, and a thick smear of cream cheese that resembles a brush stroke. 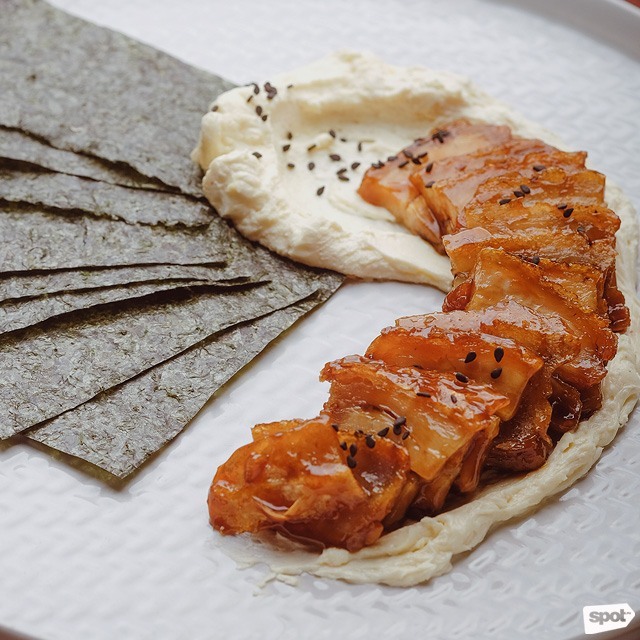 Take a piece of chicharrón, add a generous layer of cream cheese, and wrap these all in the nori. Pop them in your mouth, and prepare yourself for a rich explosion of cheese and succulence. Artsy haven The Craft Central now has a café at their Vertis North branch, and the food is more than an afterthought. They want diners to be able to work on their art while also snacking, so expect their grub to be easy to munch on. 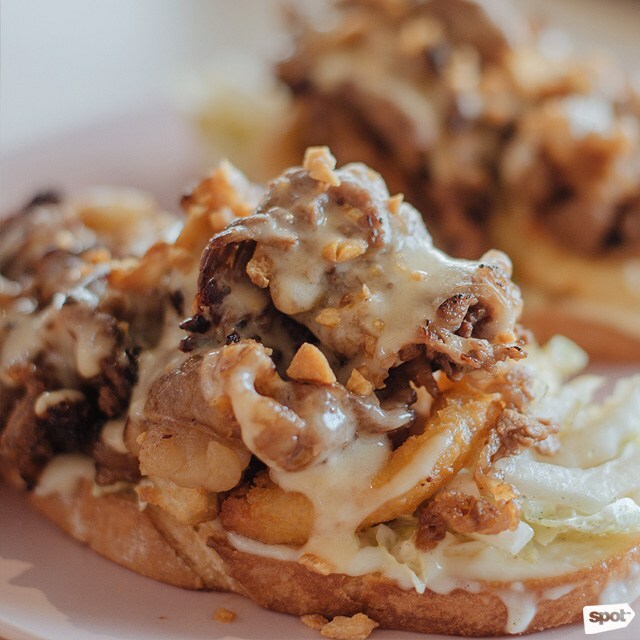 The Garlic Cheese Steak Sandwich (P260/single, P340/double), for example, is a bite-sized take on a cheesesteak sandwich, but you can expect the same savory cheesiness. The open-faced sandwich comes with a mound of tender beef slivers that’s slathered with garlic aioli and mustard mayo, then covered in melted cheese. It all doesn’t get too overpowering for the palate, though, with a nest of napa cabbage to take some of the richness off. 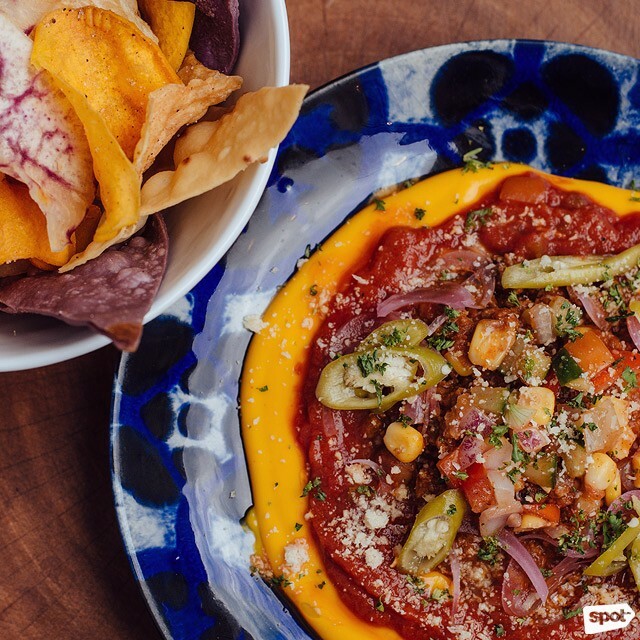 For a new, extra-cheesy take on nachos, head to the ultra-colorful Yuca at Venice Grand Canal Mall. Tio Romy’s Nachos (P250) comes in special picture-perfect presentation that’ll most likely end up on your feed. But it isn’t just for aesthetics: Serving the nachos—which are a mix of potato, purple yam, cassava, and squash—separately from the cheese and marinara dip keeps the chips as crisp as when they first got on the table. Plus, you can have as much cheese dip as you want, and who doesn’t want that? Even with 81 SeiHai's over-the-top interiors and a menu of Japanese dishes that are prepared in unusual, over-the-top ways, the Flaming Maki (P400) still manages to turn heads. After all, a gigantic roll completely covered in a thick cheese sauce is impossible to ignore. Underneath the gooey blanket is a roll stuffed with salmon, deep-fried crab, cream cheese, and cucumber. Finishing this one can be a messy challenge, but it’s one you’ll happily take on. Mexican and Korean cuisines have lots in common: They love beef, they love spice, and they love lots of gooey cheese. So it’s almost a given that Kor-Mex restaurant Vatos Urban Tacos has an extra cheesy dish on offer. 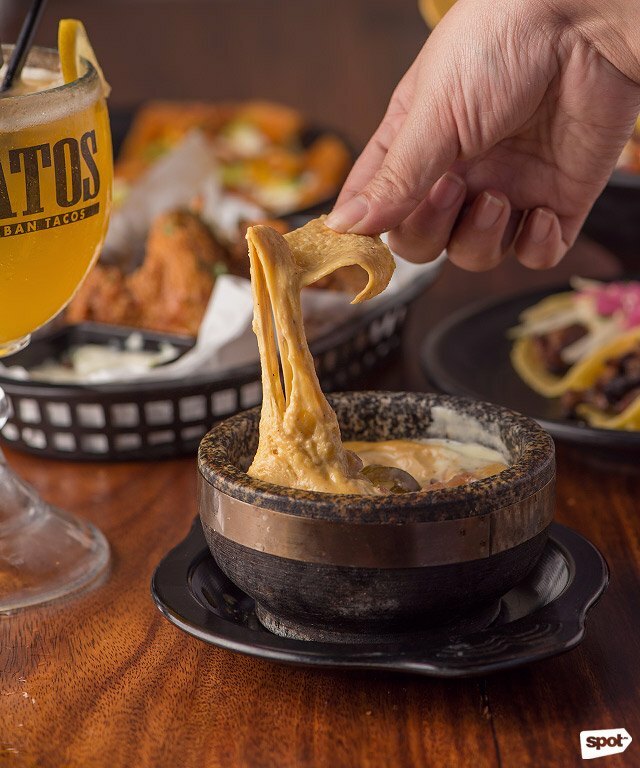 The Vatos Cowboy Queso (P390) has a blend of melted Pepper Jack and cheddar cheese that’s so tasty you almost want to just have it by itself—but that’s not all there is to this dip. Dig in with your nachos and discover a hidden layer of black beans, jalapeños, pico de gallo, and more. The surprisingly mild cheese dip provides a great contrast with the other, much more savory elements, that you’ll get addicted to this in no time. For the ultimate comforting dish, it doesn’t get better than poutine. French fries, warm gravy, and cheese curds—what more can you ask for? But Pompoms manages to still take it to the next level with...fried chicken! 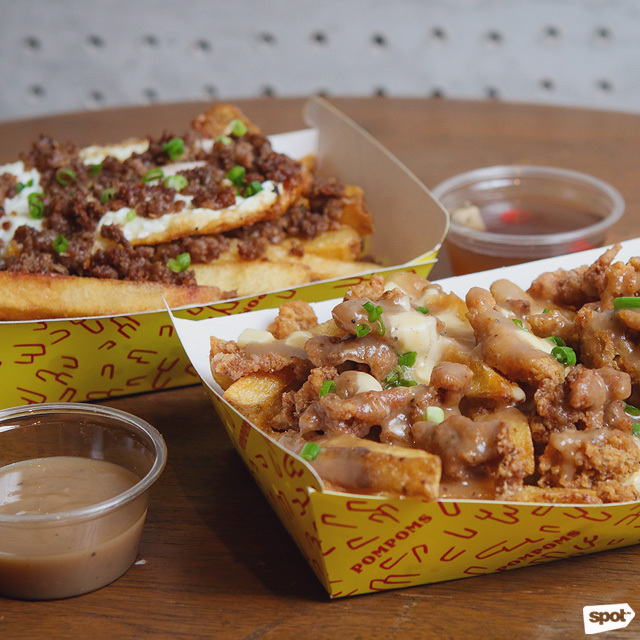 PomPom’s Fried Chicken Poutine (P199) has thick-cut, perfectly crisp-on-the-outside, fluffy-on-the-inside French fries, which is covered in tasty gravy, melted cheese, and more-than-sizeable fried chicken chunks. We can’t think of any reason not to feel happy after having this. PomPoms is at G/F Pedro Gil Wing, Robinsons Manila, Pedro Gil Street, Ermita, Manila. 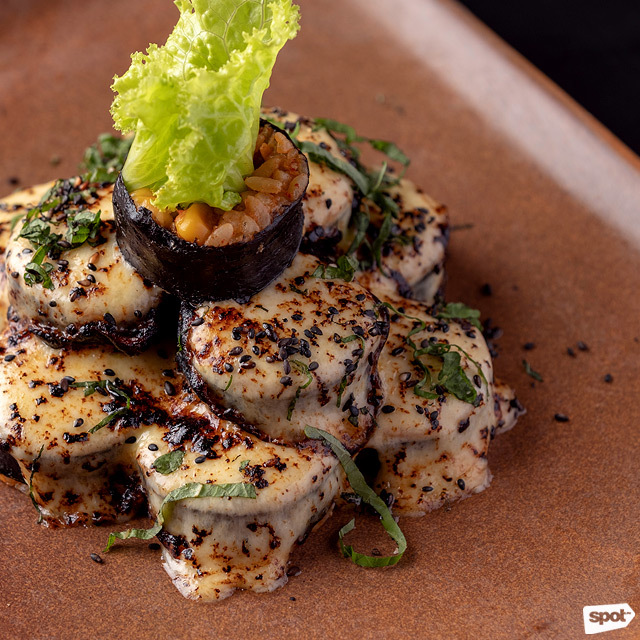 Gaja may look like your regular Korean restaurant, and it’s anything but—Chef Marc Justin Tee takes the flavor profile of traditional Korean dishes and plays around with them to create something new yet familiar. But if there’s one dish that he goes crazy with, it’s the Kimbap Aburi (P360). 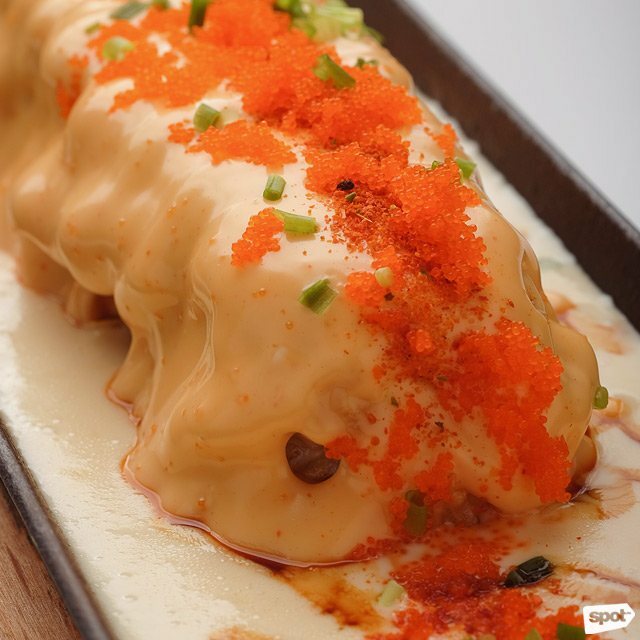 An order will get you bulgogi-stuffed kimbap, which is then blanketed in a rich cheese-aburi sauce (though Chef Marc won’t share the full recipe, he says this has mozzarella for extra gooeyness). The result is almost sinfully rich, but that won’t stop you from finishing a roll.